Waste collection in Mandalay City needs an upgrade. Photo credit: ADB. The Mandalay City Development Committee collects the waste generated by the six townships in Myanmar’s second largest city, Mandalay. Collection is notionally door-to-door, but large areas are serviced through community bins and informal dumping areas. In addition, the landfill site is in urgent need of changes to avoid generating landfill leachate. The Asian Development Bank (ADB) provided technical assistance on mainstreaming solid waste management to Mandalay and four other cities in Asia. Key assistance was a review and upgrade of municipal 10-year plans for solid waste management plus one tailored project per city. Issues covered were waste avoidance, minimization, and recycling; waste haulage and disposal; and information, education and communication campaigns. In Mandalay, after consulting stakeholders, the project team and the city government developed and agreed on an enhanced 10-year integrated solid waste management plan. Due to strong interest from city, the project team conducted a pre-feasibility study on privatizing waste collection in one town, Chan Aye Thar Zan. Waste generated in the six townships that make up Mandalay is collected by the Cleansing Department of the Mandalay City Development Committee, and is notionally door-to-door. However, large areas are serviced by community bins and informal primary dumping areas throughout the city. The bins are also used by commercial and institutional establishments. The waste collection fleet is composed of waste compactor vehicles, tipping vehicles, hook lift bins with both covered and uncovered containers, small tricycle collection vehicles, and push carts. Overall the collection service is barely adequate and improvements are required to bring Mandalay in line with the more progressive cities in the region. The city’s two landfill sites are operated as uncontrolled dumps. Staff appear to lack skills required for improving the operation. For example, both sites have extensive areas of uncovered waste placed at very flat slopes, thereby maximizing leachate generation and associated hazards. Leachate was observed flowing off the southern dumpsite onto neighbouring properties in dry weather. Overall, the sites are poorly run, and fundamental operational and design errors are compounded by budget limitations, which impacts on availability of suitable equipment and material. Examples include an adequate supply of soil cover for daily, intermediate, and final cover application. Therefore, additional expertise is required to operate the site as well as to remediate previously worked areas to a suitable standard. The project team reviewed, evaluated, and upgraded Mandalay City’s 10-year solid waste management plan. It recommended changes and corrections based on the waste characterization data and projections, and on the solid waste management template of ADB. These include initial advice on remediation priorities. The project team also noted that the landfill sites will have a 3- to 5-year life with the current footprint. The project team chose Chan Aye Thar Zan Township of Mandalay as the pilot area for privatizing waste collection. The pilot township was identified during the project preparatory stage through a series of meetings attended by officers of the Cleansing Department, former Mandalay City Development Committee members, the former head of the department, and all the township executive officers. The study looked at a privatized fleet of mainly compactors that collect waste door-to-door or from skip bins. It would be fully mechanized and efficient. The private operator could be contracted to provide the staff and technology, but could also be contracted to supply the collection equipment if a longer contract term was awarded. The lack of understanding of the public-private partnership structure and responsibilities will make Cleansing Department and Mandalay City Development Committee staff reluctant to adopt privatization, even if senior management continues to pledge support as they initially did. 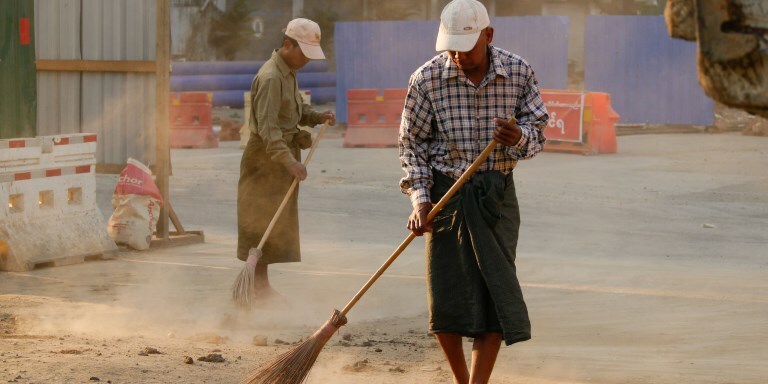 The history of failure in solid waste management public-private partnerships in Yangon appeared to influence staff thinking, even though the systemic failures in those contracts were explained during meetings. Much more training, advocacy and discussion will be needed to fully engage the staff and senior managers to gain their support for privatization. Following on from the acceptance of the integrated solid waste management plan, the project and the Mandalay City Development Committee agreed on a range of interventions. Due to the very dynamic political situation and the change in elected representatives and senior management during the project, only the items and outcomes were agreed, but there were no timelines for implementing actions. Agreed actions included public awareness campaigns on how to avoid waste and on recycling; increasing the frequency of waste collection; establishing a functional and appropriate waste disposal facility; and establishing a formal Solid Waste Management Commission. One of the insights following the preparation of the solid waste management plan and discussions with the private sector is the question of how much a private company would rely on the technical and financial information contained in the plan. The project found that the private sector considers it necessary to carry out local detailed site assessments prior to finalizing their collection fleet and routes. Throughout the project, the team engaged mainly with the senior management of the Cleansing Department. However, the real decision maker is the Mandalay City Development Committee as provided by law. The election of committee members had not yet been concluded during project implementation. As a result, there was a continuing missing link between the project and senior key decision makers. A key lesson is the project may have needed a longer period to allow access to the real decision makers, although there was no guarantee the committee positions would be filled. The personnel of the Cleansing Department and Mandalay City Development Committee are not familiar with how public-private partnerships work. Their main concern was who will take responsibility if the system fails. A lesson here is much more training, advocacy and discussion will be needed to fully engage the staff and senior managers to support privatization. The Cleansing Department is responsible for preparing draft short-term plans and implementation within the policy and program framework of the city committee and regional government. The head of the department is a non-voting participant in the city committee and is generally asked to provide technical and managerial recommendations on issues for the decision of the committee. To improve solid waste management, more responsibility needs to be devolved to the Cleansing Department to attract more investments and human resources. To the extent permissible by the law, it should be detached from the government system in order to reduce its political obligations and to become a self-sustaining business-oriented corporation.